Winter, not my favorite season, but at least with it so cold and snowy out I have an excuse to be slobbing around my house in sweatpants and eating my favorite things(Ha, Ha, like I need an excuse to do that!). 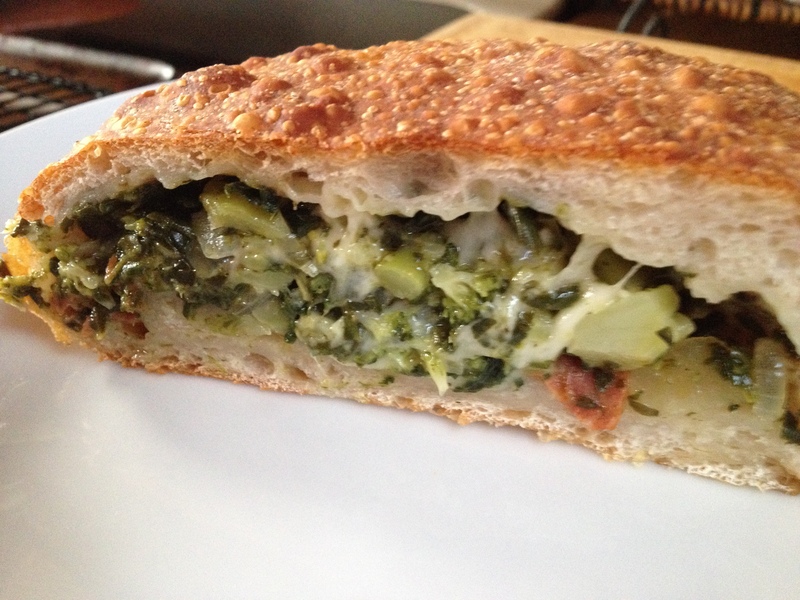 Anyway, decided that I would make one of my old standbys, Spinach and Broccoli Pie. As you are aware of my peculiar affinity for any greens: spinach, kale, collards, bok choy, chard…(you name it, I’ll eat it) I’m sure this will not surprise you. Actually, I started eating these when I was young and living in an area that was blessed with a fair number of lovely Italian bakeries. They were inexpensive, filling and redolent with delicious olive oil. Some of them had little nuggets of olives, or pepperoni, too. When I moved to South County, there were less of these bakeries and I had to make my own if I needed a fix. 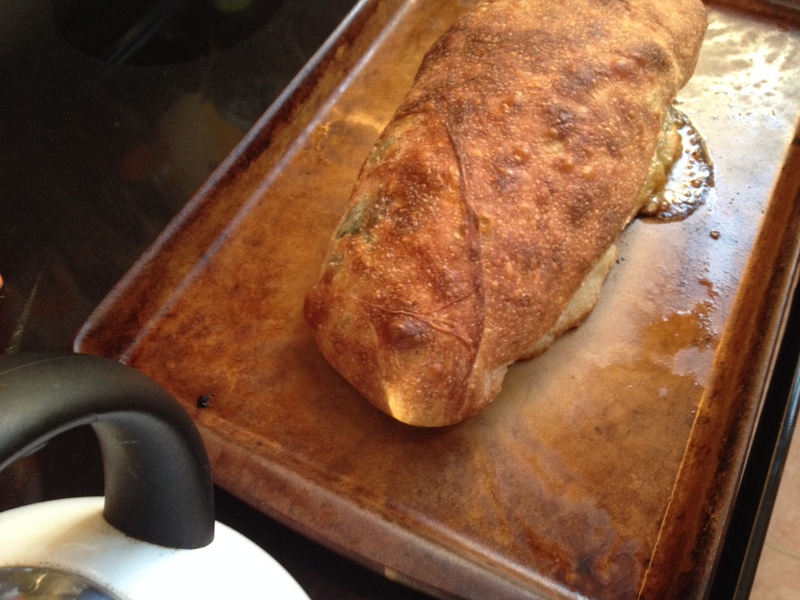 Roll out your dough onto pan that has been treated with olive oil. Let it rest if it is too springy, and you can stretch it a little more once it has rested. It does not have to have a perfect shape. Just do your best. 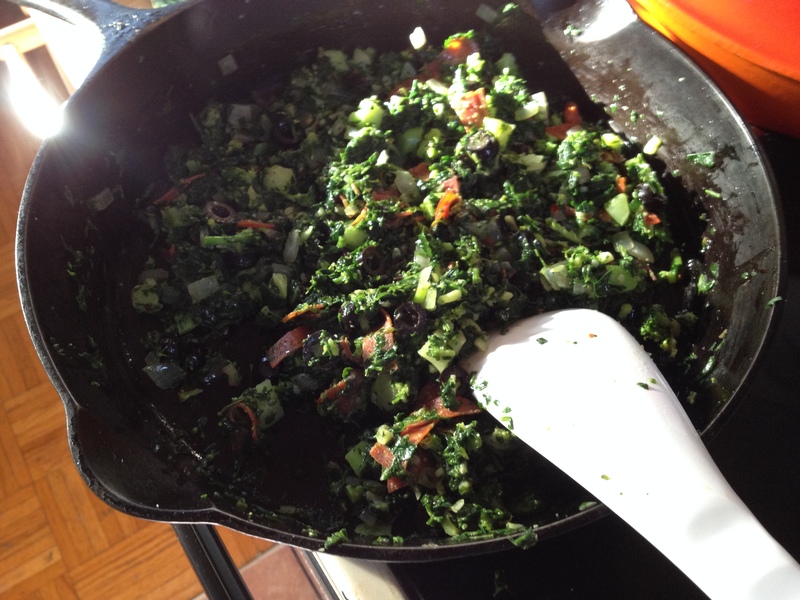 Then sauté the onions, garlic, spinach and broccoli in a pan with a good shot of olive oil until the veggies are tender. Take off the burner and add olives, pepperoni, salt, pepper, garlic & onion powder and red pepper flakes and mix thoroughly. Add as much or as little of the seasoning that you like. Let cool. 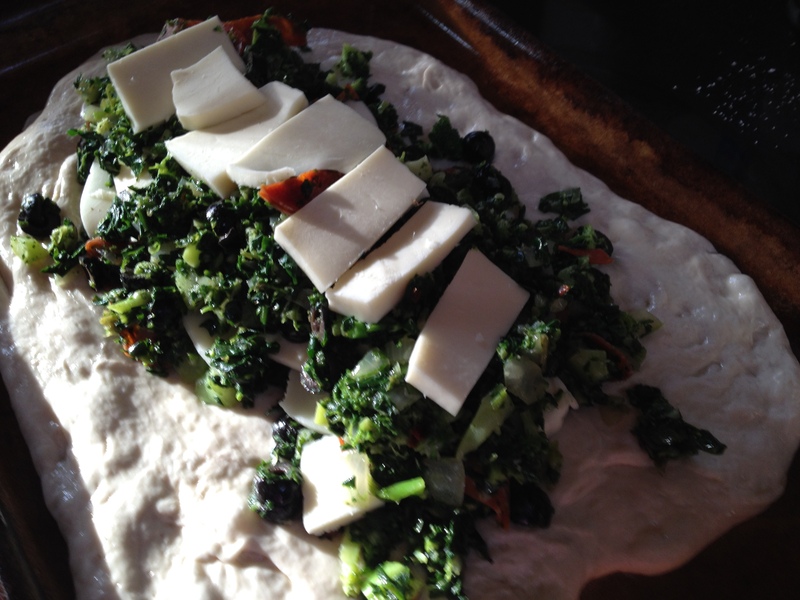 When cool, put some of the mixture in the middle of your rolled out dough. Add cheese slices, and then add the rest of the mixture. 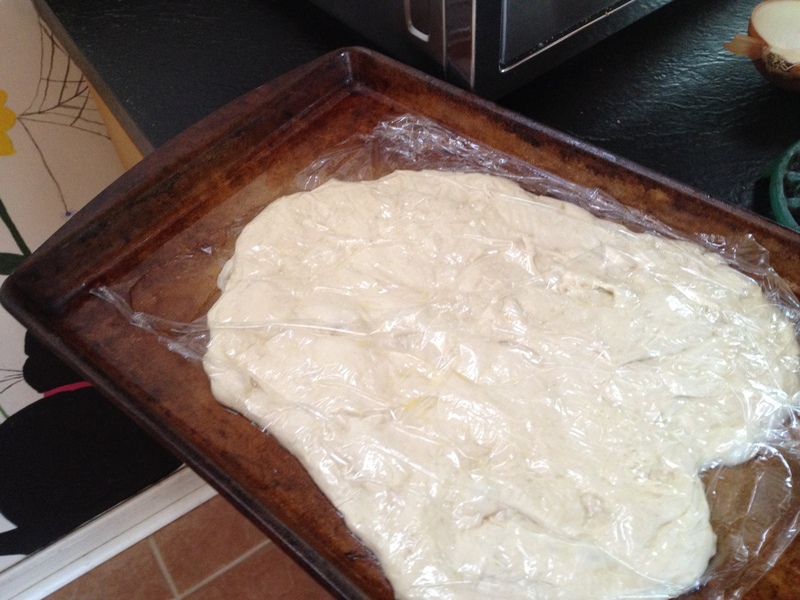 Fold the sides of the dough over the top of the mixture, and roll up ends. Flip the pie over so the seam and rolled up ends are on the bottom, against the pan. Since the pan was coated with olive oil, the pie should be well oiled. If not, add more oil which will help with the browning. 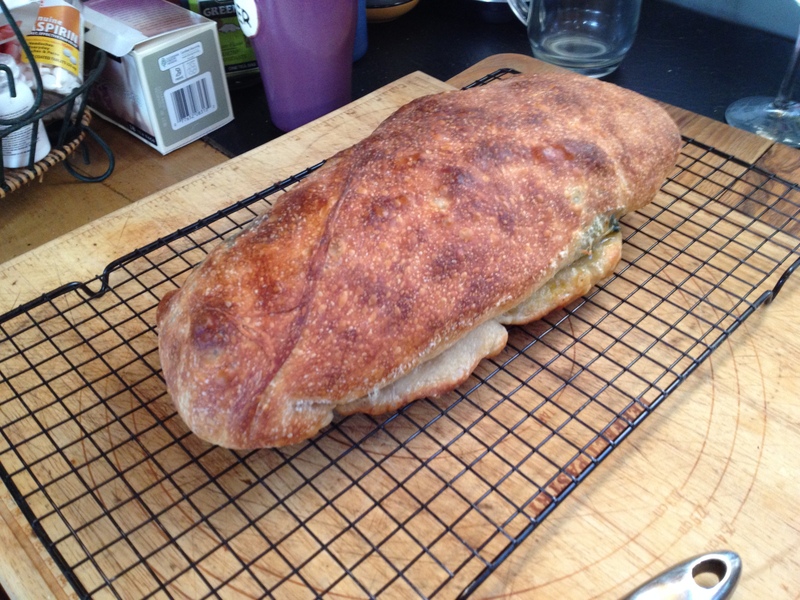 Bake at 350 degrees for about 30 minutes, or until the crust is browned nicely. Don’t worry f it leaks a little…it will still be delicious. Let it cool and enjoy a piece. Really good with soup as well.